I think the weather is supposed to be good (i.e. dry), so you might as well be outside. Add your own touch to the graffiti wall. Supplies provided or bring your own. I don't know if I could handle these many bands, but it's easy to get your money's worth. Keep in mind the drinks are cheaper at PA's Lounge. We're bringin' it back! Continuuing the tradition of the original Deep Heaven ambient/psych festivals of the '90s in Boston we bring you Deep Heaven Now! featuring the very best of the East Coast ambient/psychedelic rock scene. The cover gets you into both clubs, back and forth. And supposedly the "first 50 people to show up at the event get 2 free beers". 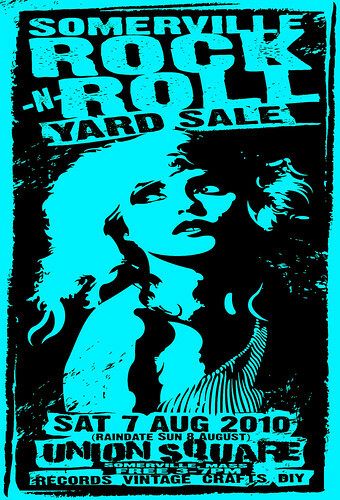 It's free to browse and listen to the live music, but there's going to be all sorts of cool stuff for sale like t-shirts, records, handmade stuff -- everything very rock 'n roll. It's a good line-up with quality and variety. I give a big thumbs up to the winning soul/funk/rock formula of Bad Rabbits. I assume they're going on first or second. If you're not having a good time, there's no cost to leave. Go late or early for top-notch rockin' Americana. This tragedy is one of Shakespeare's best. Go get some culture and support public arts! If you want to get there early for a good spot and/or picnicking, there'll be some big band tunes from the Beantown Swing Orchestra from 6pm to 7pm. There is more rock in Union Square, but you really can't beat this lineup for lots of great rock/pop/punk and a serious amount of girl-powered rock! This gig is slightly over the usual limit, but it's my personal cheap rock-pick-of-the-weekend. If you can prove you were at the show and you didn't like it, I'll figure out a way to give you $2. There's even some talk of a toy giveaway with a download code for This Blue Heaven's new EP, which I've heard and it's melodic, rocking awesomeness. If you are having a good time, you really should stick around after the Downbeat 5's set for a special musical cap to the night. Interactive video art projected on the wall of the bank where you can text a message that might become part of the display. Swing by if you're in the neighborhood. There's no better way to sample local food trucks than to have them in one location. It's obviously not ALL of the area's choices, but one should really try Speed's or M&M Ribs -- and this is probably more convenient than their normal spots. This is the day with a matinee performance. Try samples of about a dozen magnificent cheeses made in New England. People are encouraged to "Bring a blanket and your favorite beverage." If you haven't been to the Growing Center, it's like a lovely garden-like oasis. Why not finish the week with big, bold, noisy, shoegazey, synthy rock?